During my studies on the problem of the Bodh Gaya temple, I realised that there was prevailing a very ancient cult of Brahma and Dharma, not only at Gaya but perhaps all over India. Further studies led to the writing of this book. During the investigation, I have found light on many knotty problems of Indian religions and religious history of India which has been incorporated herein. The chapters were published in the Journal of the Bihar Research Society, Patna, in its issues Vols, XL, XLI, XLII. I am very grateful to the Society for having allowed me to publish the articles in this book form. It is regrettable that the Appendices could not be publi- shed in the aforesaid Journal due to the press being transferred from Patna to Delhi. I had to print them in another press. I had a desire to attach some plates to illustrate the last chapter, but I failed. I hope the book will be of interest to scholars as well as all lovers of the history of Indian religions. I crave forgive- ness from the readers for typographical errors and other defects in the book. 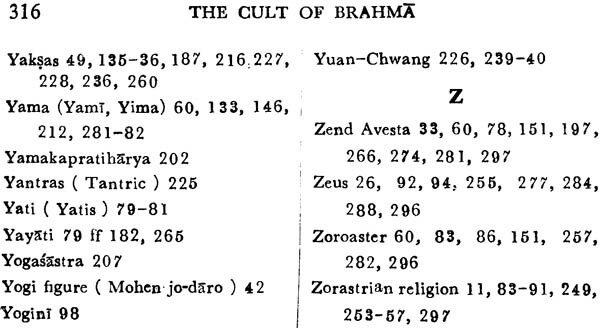 I venture to publish the second edition of the "Cult of Brahma" being encouraged by several scholars and by being able to secure many stronger evidences to prove my conten- tions. The very nature of the evidences put forth earlier, I had confessed in the earlier Preface, could not certainly prove many things conclusively. Further study helped me in collecting better, sronger and definite proofs. But a few words are necessary to discuss the reliability of the evidences. To discuss the religious history of a country, certainly the religious texts and traditions contained therein are our main sources. But the uncertainty of the dates of the composition or origin of the Indian religious literature is a great stumbling block. 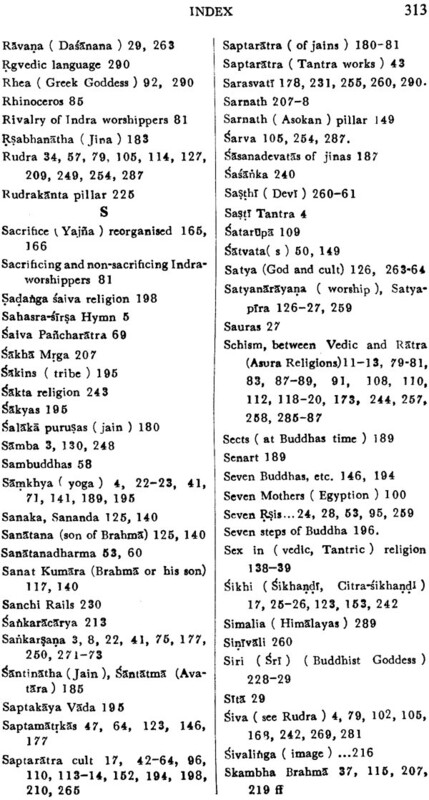 But I could not do away with the evidences of the Puranas, the Ramayana and the Mahabharata and such other works which are known to be full of interpolations of unknown periods and the dates of even the original texts of which are not also definitely known. So, as I accepted the evidences of these unknown periods, I tried wherever possible to adduce evidences from non-Hindu or Foreign books or those gene- rally accepted to be of earlier dates to support each of those evidences. 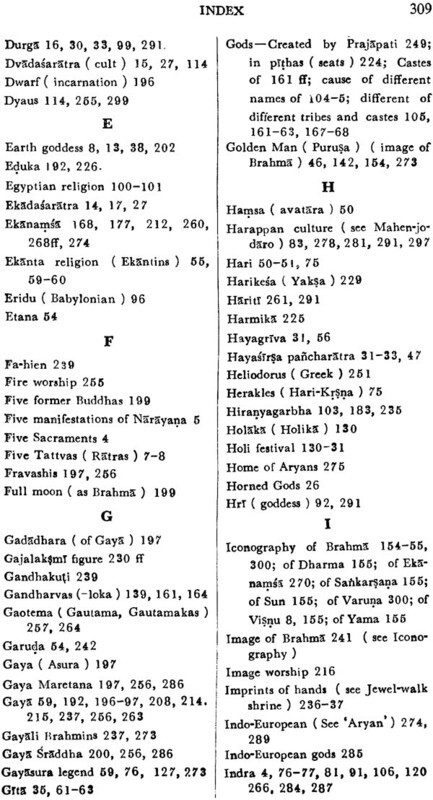 Traditions found in later texts of the Puranas or the Epics, if supported by early Jain, Buddhist or Foreign sources may be accepted as early traditions. It will be seen in this book that many such matters found in the generally supposed late works have been traced by me in certain form in the early Buddhist or Jain texts. I may cite here the cases of the legends about Brahmadatta brothers, the story of Candgala Matanga, Goddess Kalakarni or Kali, the Puskara Tirtha, the Gayasura legends and some others. 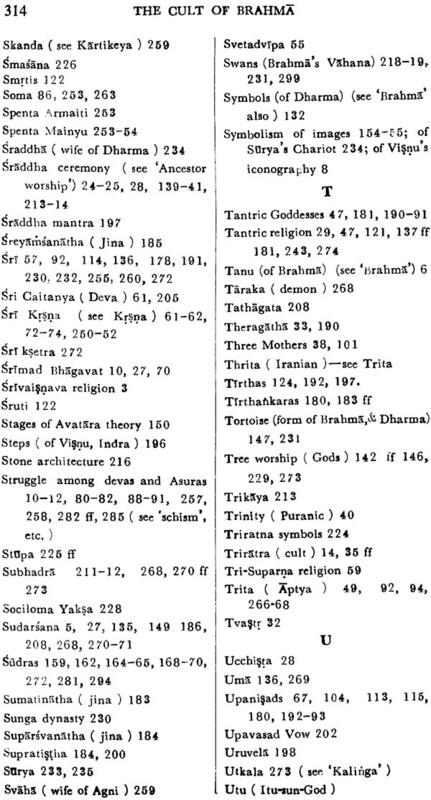 These are found In the Santiparva of the Mahabharata or such works which are generally discarded by scholars as being later in origin. 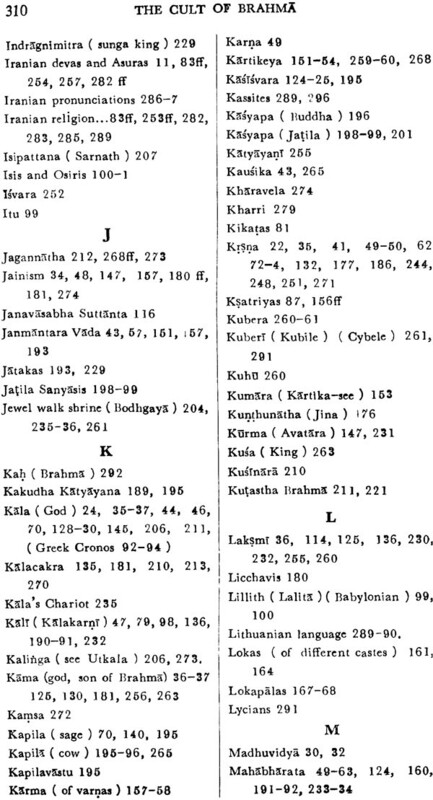 But I have tried to prove their antiquity by reference to the Jatakas, early Buddhist or Jain texts. It is for the scholars to judge if I have succeeded in doing it. In some cases, I have even given proofs to show that I do not accept the dates which are generally ascribed to certain texts or to certain portions of those texts. 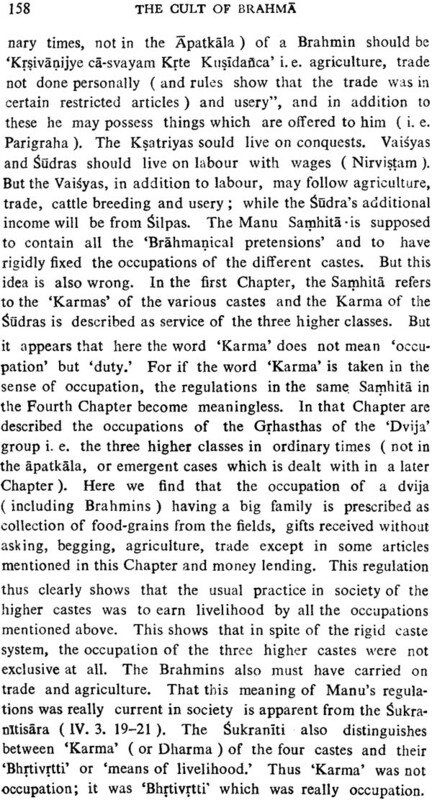 In fact we do not find agree- ment among scholars regarding the dates of the Indian works and it is very difficult to judge and accept anyone of them to have been proved conclusively. It is, therefore, not possible or wise to discard the so-called late texts unless and until every part of them is definitely proved to be later or inter- polated. 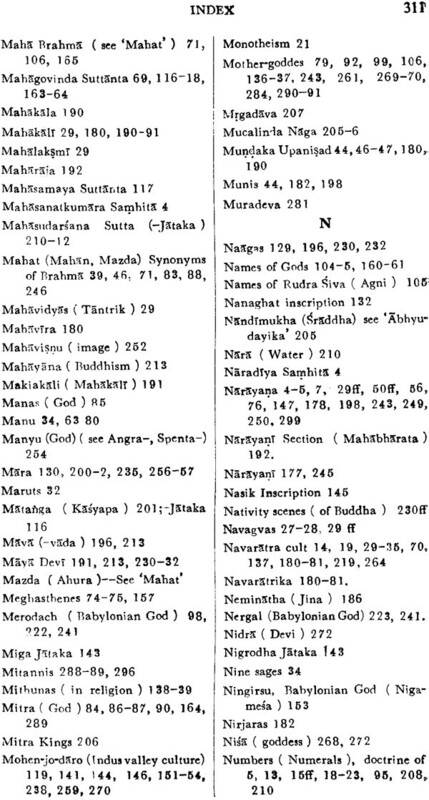 Volumes have been written about Kautilya's Artha- sastra, but no one can definitely prove the date of its compo- sition. I, therefore, request the readers to try to ascertain the validity of my arguments from various points of view, without being prejudiced by the mere fact of these being taken from generally supposed late texts. Wherever possible, I tried to find out archaeological evidences too to prove my contentions, though I confess they are very meagre. The new evidences further emboldens me to make here a general review of my main contentions. 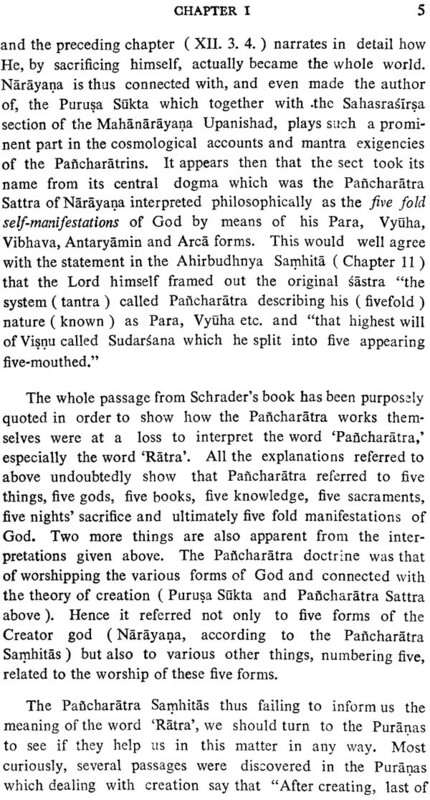 The Pancharatra cult which is generally supposed to be a Vaisnava one was originally the worship of five (seven or nine, etc. ) 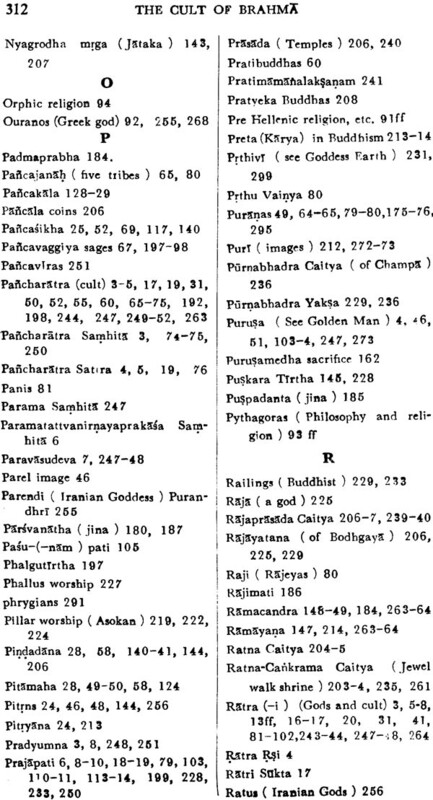 elements (Pancamababhutas, etc.). 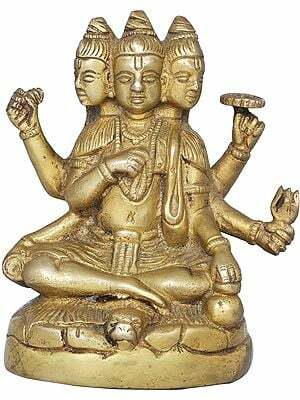 These in a later age were wor- shipped as five forms of a creator (God) called Brahma. 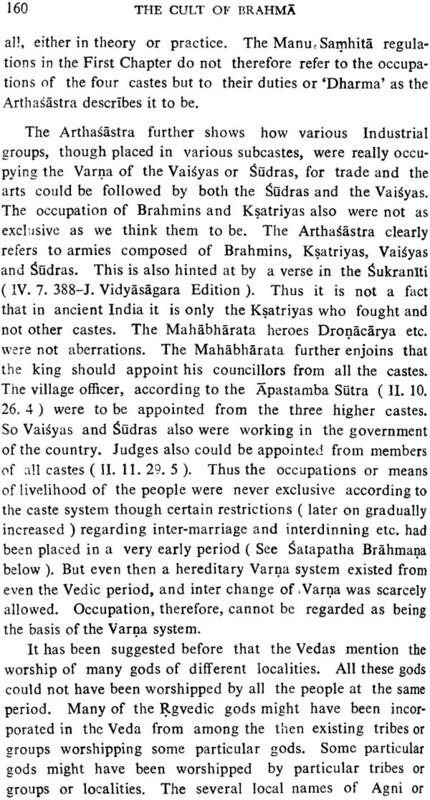 But perhaps even then the idea of their divinity (Devatva) did not arise among the Indians. 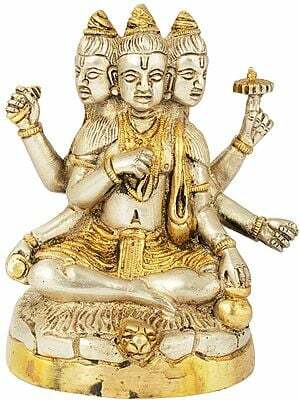 The objects of worship were known as Asuras, the meaning of which is still unknown to scholars. This form of religion existed not only in India, but also in prezoroastrian Iran. This religion may be said to be a crude form of worship of the Natural phenomena as manifestations of a creative spirit or force. With the ad- vance of time and civilization, the idea of the divinity of those natural phenomena arose and this Vedic religion created the Devas (Gods) by anthropomorphising them whose favour now was sought after by singing hymns in their praise and offering of sacrifices and by other magical rites. 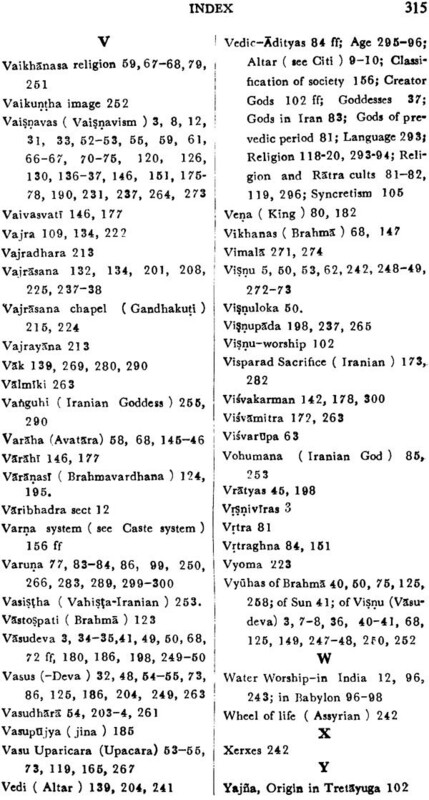 This new religion of Devas, however, was first accepted by only one section of the Indians and Iranians, while others followed the worship of Asuras and Brahma, Naturally a religious struggle followed both in Iran and India which is known as the war of the Devas and Asuras, If the Brahmana legends; as supported also by Rgvedic ones are to be believed, we may say that sometimes the worshippers of Devas won victory and on other occasions they were defeated. The defeated sections of people were either killed or driven away from Iran and India. With the coming of a settled state, in India the Vedic worshippers became more predominant, while in Iran the Asura worshippers appear to have been in power. It was now that the Gods of India were called Devas (instead of Asuras, as found even in the Rgveda ) and the term Asura got an abominable meaning ( demons). 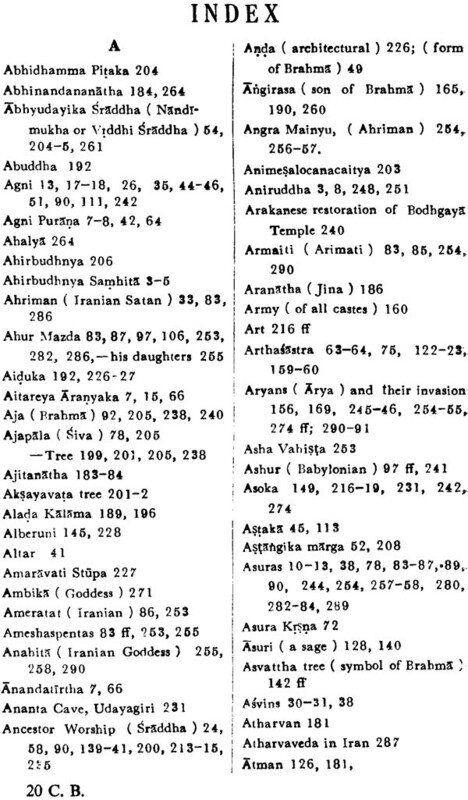 In Iran the powerful section being Asura worshippers had not to change the- meaning of the word 'Asura'; but they made the Devas now to mean the followers of their satan (Ahrirnan). 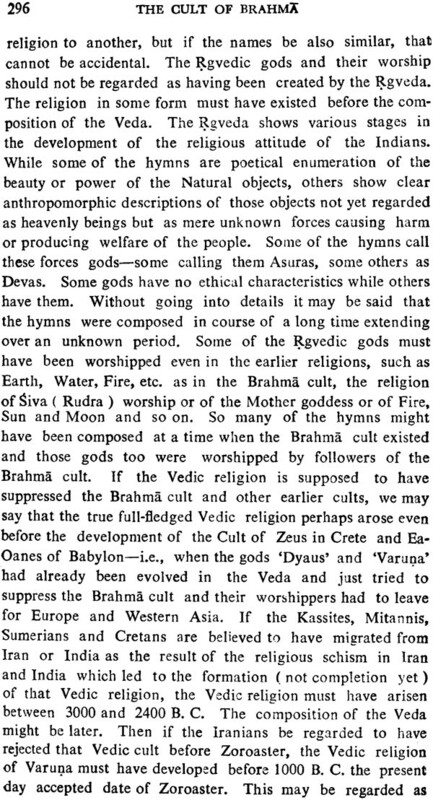 In India the upper class people worshipped Vedic gods (Devas) and the cult of Brahms became a religion of the lower one. In Iran Ahura Mazda (Asura Mahat = Brahma ) was the chief god of the Asura worshippers and Zoroaster forbade the wor- ship of Devas. A section however continued to follow the Deva worship and they had to be suppressed by later Acha- menian Emperors, as their inscriptions indicate. In India again, the old objects of worship of the followers of Brahma cult ( i.e. the elements) were now called Ratras by the Vedic people as opposed to Diva gods (Devas), for the latter thought their new gods to have given new light (spiritual) to them. Many Vedic gods are described in the hymns to" have brought 'light' ( = day) to the people. The Zoroastrian god Ahura Mazda is similarly believed to be a god of Light,. whereas Ahriman (Satan) was darkness incarnate. It was perhaps for this that the Vedic people hated the black colour ( Krsna ) so much, black being equivalent to darkness ( Tamah ) and not because they had to fight with a black race of men. 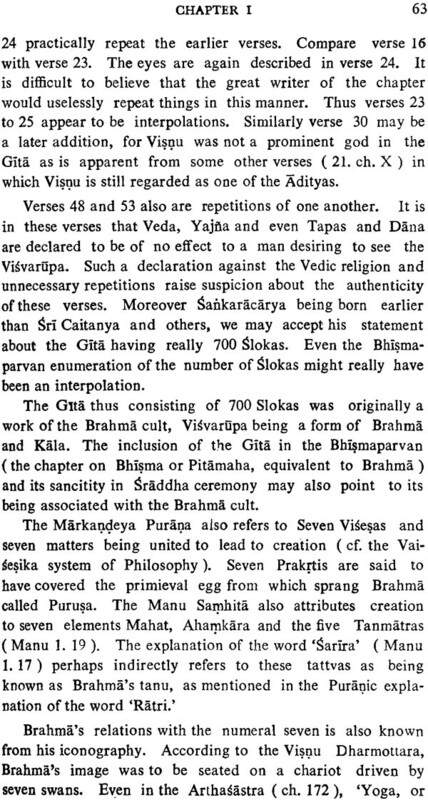 There were five well known cults in ancient India-the Saiva, Sakta, Vaisnava, Ganapatya and Saura. But all the Hindus believe that the three gods, viz, Brahma, Visnu and Siva are the principal gods to be worshipped. In spite of this belief, no sect is known to have existed in India wor- shipping Brahms as its principal god. 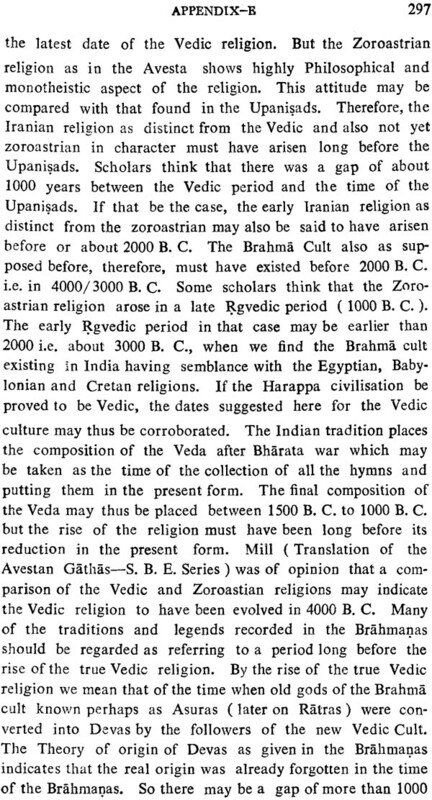 Scholars believe that in the later Vedic period, i.e. 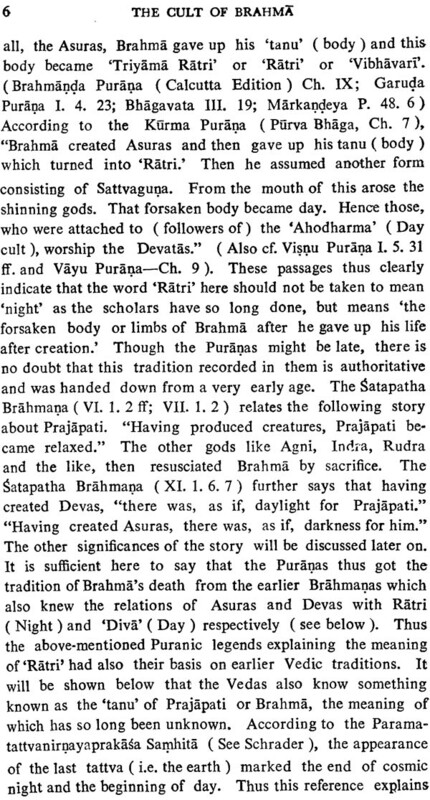 the Brahmana period, a god named Prajapati began to be worshipped, and he later on was known as Brahma, An attempt was made to make him one of the trinities but he never became a predominant god. 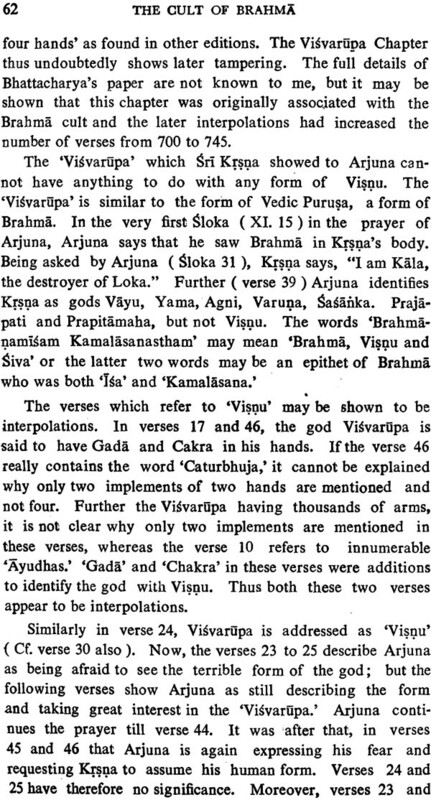 Study of the ancient religious literature has led me to- conclude that Brahma was the earliest creator god of India. He was perhaps a pre-Vedic god. His worship was suppres- sed by the Vedic religion, but it survived in various parts of India, especially in Eastern India, among the Asuras of the Vedas, and even in the Historic period, among the low class people. All religions and sects, however, had to acknowledge their debts to and accept the authority of god Brahma. 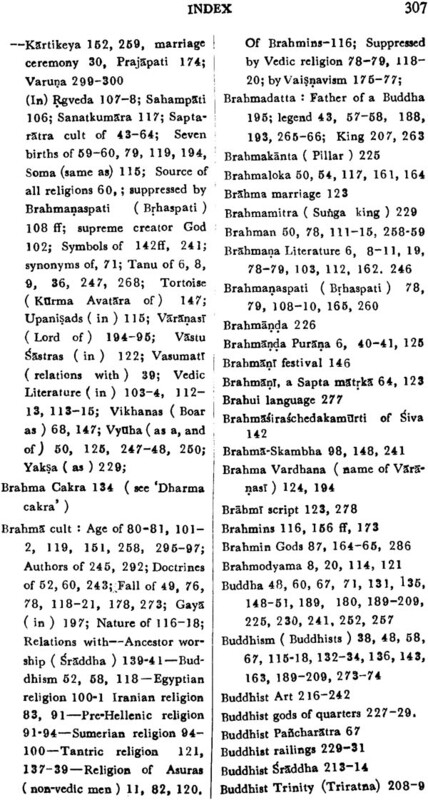 Even the Vedas are said to have been creations of Brahms. 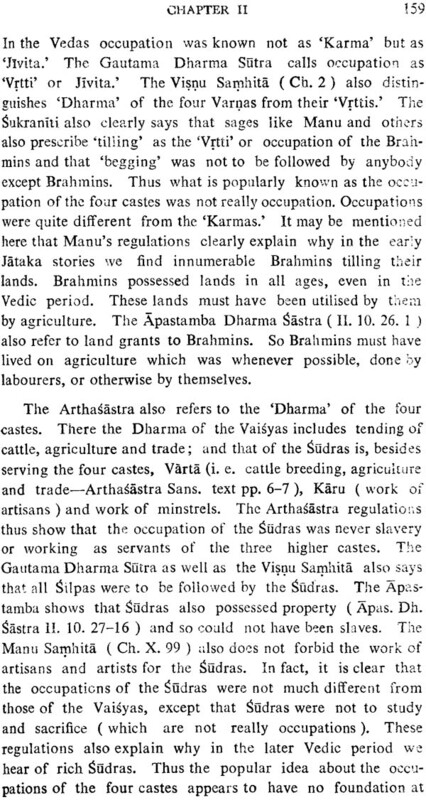 Jainism and Buddhism arose out of the cult of Brahma. The cult again made some progress after the fall of the heyday of Buddhism. 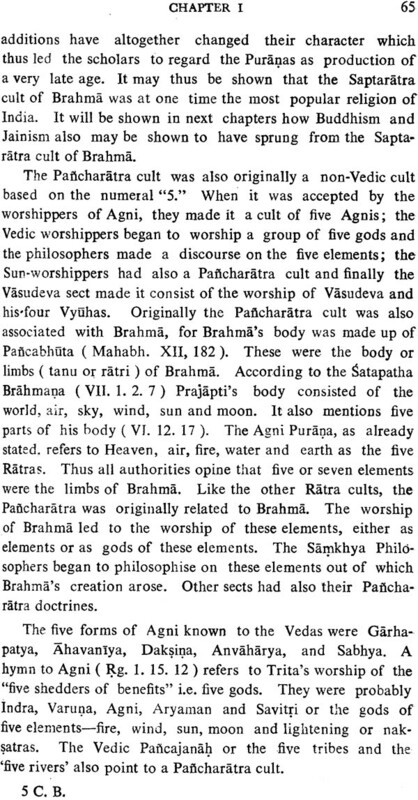 It has been endeavoured to show that the Brahma cult as known in the pre-Vedic days included the worship of various gods of elements such as- Water, Earth, Fire, Wind, and Ether, which in the Vedas were deified and in the Samkhya Philosophy, considered as some of the Tattvas out of which creation arose. 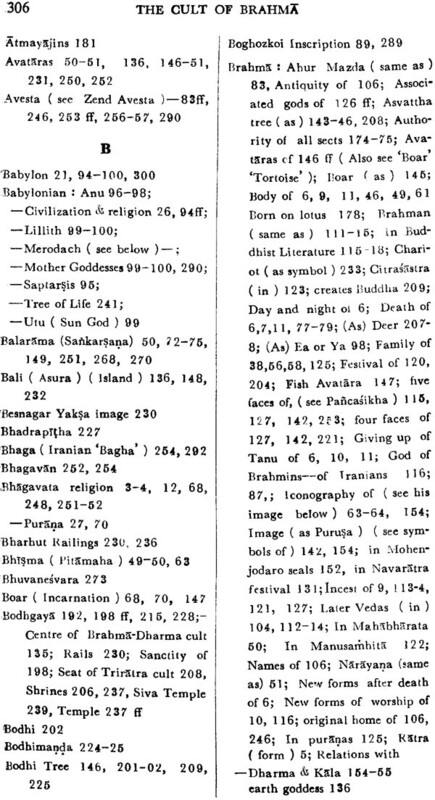 It has been further shown that the cult of Brahms or the creator god had assumed various forms in India and a strong belief arose about the sanctity of Numerals. 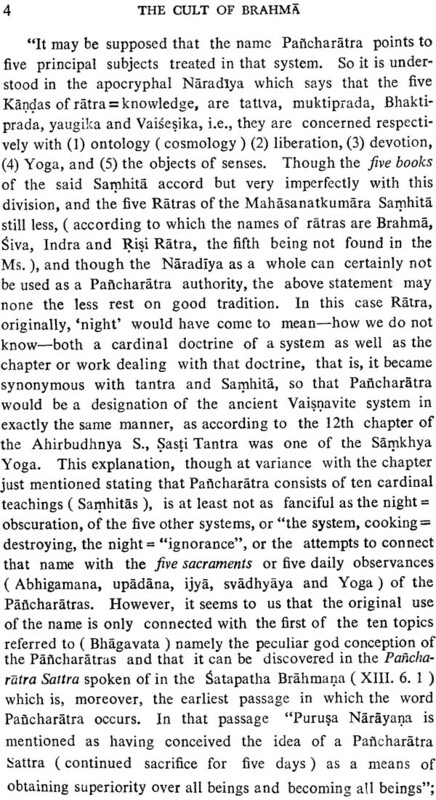 This gave rise to a Ratra cult, which again were of various num- bers-such as Navaratra, Saptaratra, Pancharatra and so on. 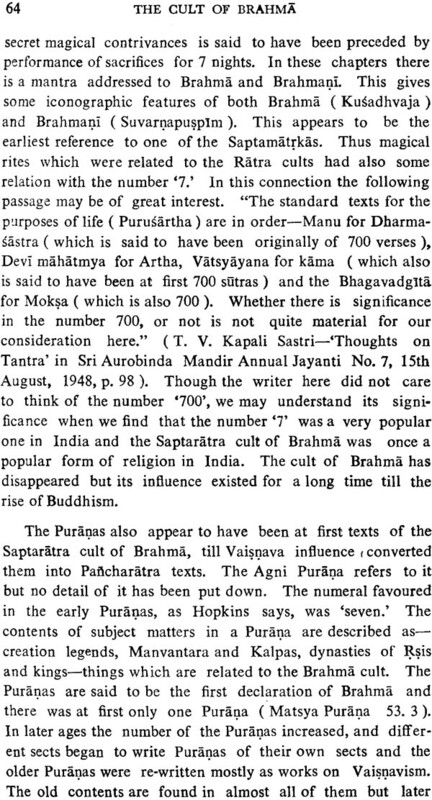 Out" of these the Saptaratra cult appears to have been the most popular one. The Pancharatra cult is well known as a form of Vaisnava religion. 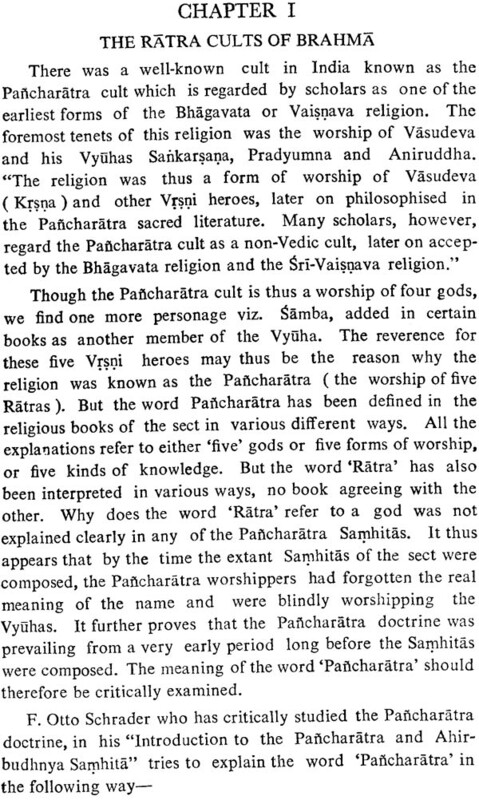 But it was also at first a cult of Brahma, and later on there were Pancharatra cults of Surya, Visnu, Samkarsana, Siva and so on. 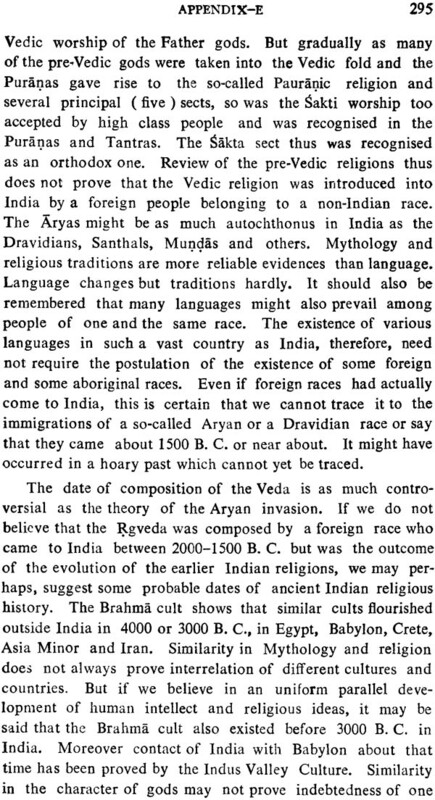 The Brahms cult was perhaps at first the religion of the Brahmins and this theory has led me to a reconsideration of the origin of the Varna system in India. This religion was suppressed by the Vedic religion, then by Jainism, Buddhism and Vaisnavism in succession. 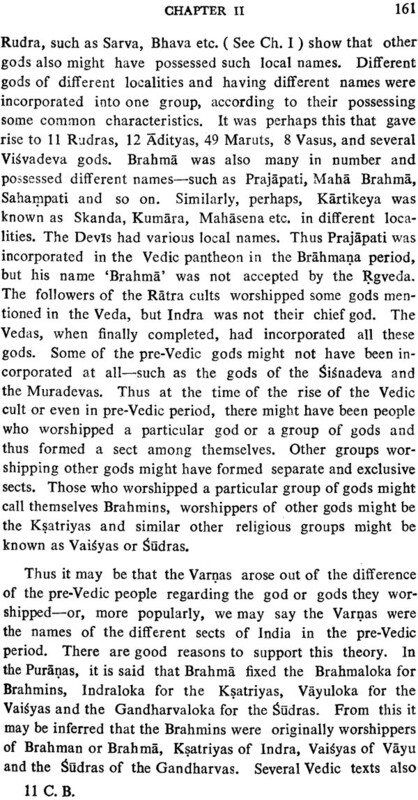 Brahma worship had assimilated that of many other gods, of which Kala, Dharma and Yama were prominent. 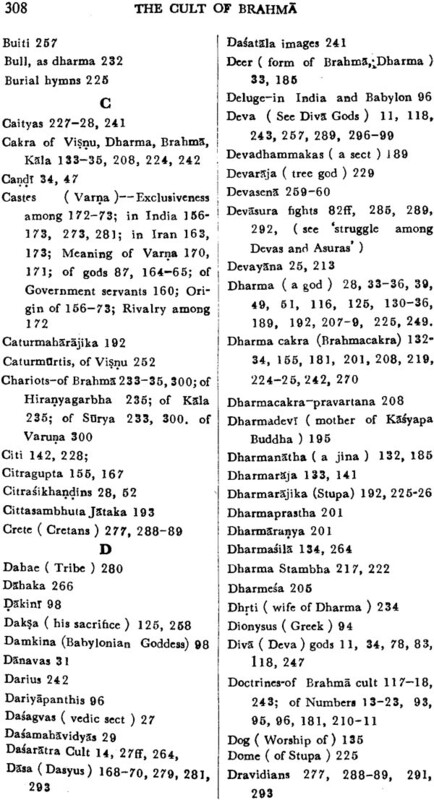 There was a god named Dharma in ancient India, but scholars generally take him to be equivalent to the Buddha. I have tried to remove this wrong idea. The worship of the Mother goddess is known to have existed in ancient India and it was quite likely associated with the Brahma cult. The cult - of Yama and the Sraddha ceremony, etc. were also the results of the Brahma cult. The knowledge of the existence of a cult of Brahma in ancient India will thus throw new light on various problems of Indian religions, traditions, and even art. It has been necessary sometimes for me to be very speculative, and con- clusions had to be drawn from very meagre evidences but this was inevitable and necessary; for the materials are so few and the cult was so ancient and cleverly suppressed by so many later religions. It is for the Indologists to judge how far I have been successful in proving my hypotheses. I shall consider my trouble fruitful if it leads the scholarly world to turn their attention to further study of the subject. 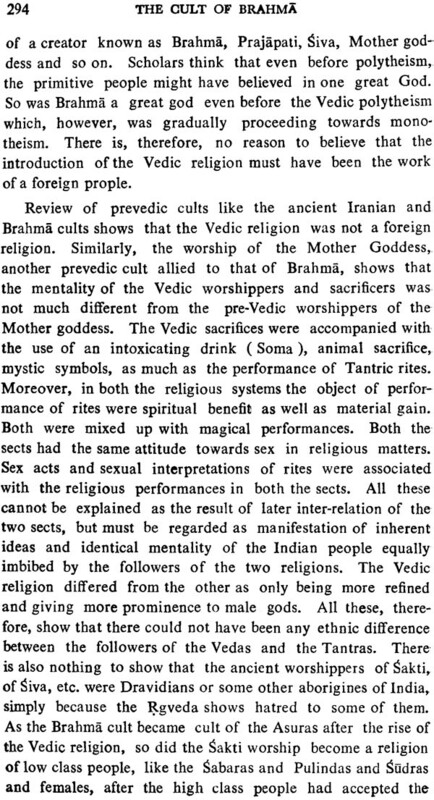 Influence of Brahma Worship on Later Cults.